The cover illustrator behind GoldLink’s new album At What Cost has a distinctive visual style inspired by Go-Go and ballroom culture. I first came across Darius Moreno's colorful, energetic work in GoldLink's recent video for "Meditation." The New York-based artist made the animated video himself using a technique called rotoscoping, meaning Moreno drew over every frame of a live action video. 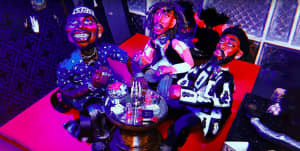 It's a painstaking process but the final result gave a new vibrancy to the world of Go-Go, a hip-hop hybrid local to – and fiercely protected by – Washington, D.C, where both Moreno and GoldLink grew up. "I felt like it would be nostalgic for anyone who is from our generation and grew up in our area," Moreno told me over email. And when GoldLink shared the cover art for his new, debut album At What Cost, the grand scale of Moreno's vision began to reveal itself. His depiction of GoldLink builds on an existing portrait series of Moreno's favorite rappers and other black subjects. Moreno finds raw material in the usual visual codes of hip-hop — money, power, women — but renders this with an enticing ambiguity and playfulness; artists are turned into elvish creatures whose depths are reflected in Moreno's powerful blends of color. I've never been to D.C., Maryland, or Virginia, the tri-state area known as the DMV, but it's not hard to imagine Moreno's art appearing as a mural in a historic neighborhood. Over email, Moreno told me about the DMV, being a black artist in New York City, and how hip-hop inspires him to be the best. I'm influenced by club culture, rap music, and most of all, my hometown and friends. My favorite rappers are Project Pat and Lil Kim. My parents were and still are into hip hop and grew up in that era, so I was always listening to what they were as well — Pusha T, Outkast, Missy Elliott, and Jay-Z. The ballroom scene is also something that I started getting into when I came to New York; going to balls and seeing so many different types of people became refreshing for me. It's a whole culture that gives a certain type of energy you can only experience fully in person and I try to share that in my work. Can you describe how you felt the first time you went to a ball? The first ball I attended was The Red Ball. It was exciting to finally see a vogue competition in person. I've been to vogue nights before in NYC, but a ball is like an award show, and anyone competing is usually serving their best look. All of the categories are exciting and to see so many people from multiple backgrounds represent sexuality through dance or just a face is an art. It forces you to be completely comfortable with your sexuality in order to truly enjoy the experience and that's why I appreciate it so much. How did you get connected with GoldLink? What was that working relationship like? GoldLink and I got connected through his manager who emailed me over a year ago. We're both fans of each other's work, so once we started working together it was a smooth process because we shared a lot of the same ideas. He knew he wanted his project to portray the DMV in the best way and I knew I could show that. All the art for the album tells the story of GoldLink's life growing up with his friends as D'anthony and eventually becoming GoldLink. Describe the process of animating the "Meditation" video. What feelings were you trying to capture? When I first heard "Meditation" and the story GoldLink was telling, I thought of how it would be if he were to run into the girl he's rapping about at a Go-Go. GoldLink and I are from the same generation so we wanted to make sure to portray what's still present in DMV culture. It's certain details we knew we had to include to make it feel real, like air brushed photobooth backdrops, certain clothing brands like Solbiato, New Balance, and Helly Hansen. The poses are a key element in making it all come together, because anyone from where we are from will recognize these stereotypes that make up the DMV youth. Do you think the DMV gets fair credit for its contributions to hip-hop? I don't, but I partially blame the DMV for trying keep the culture locked in. That's something a lot of new artists are trying to change because the style needs to be shared outside the DMV. Artists shouldn't settle with their music just being played locally. You've done a number of portraits of rappers, specifically Southern ones. What attracts you to hip-hop as a subject? Hip-hop to me is the most accepting genre of music in the world, because there's a lane for everyone. But also hip-hop has always been such a competitive genre of music, and is about being the best. I put myself in that mindset when I'm working on a project. That's why I love painting portraits because, to me, the rappers I paint are the best and made marks on culture and history, which is how I want to be. Your portraits of men have a striking androgyny, even in your old school hip-hop studies. I think that's something that happens subconsciously. My paintings are a reflection of what I'm attracted to. I'm also interested in how you shade skin color. You make blackness into a sort of rainbow. How do you see your work fitting into larger conversations of black representation in the art world? The colors I use are layers of how I see black skin. People are attracted to color and can potentially understand that there is a story in everyone's skin color. My work specifically shows that there is an abundance of color in blackness. I want to bring people together with these stories. I want to represent the expression of skin color in a positive way. Show the beauty of hood and ghetto culture; it's not something to be feared but more so something to be appreciated and celebrated. What are the biggest challenges of being a young black artist in New York City right now? The biggest challenge is being compared to other young black artists, because we're all so unique. I feel like there's a movement of young black artists on the Internet right now who come from all over. The problem is people only want to see one "black artist" shine at a time when there's enough room in the art world for all of us; we don't have to be labeled as just black artist but as artists in general. It's also a challenge knowing some people may only see my work as urban or black art when I don't want to be categorized. For those who really are paying attention they see the differences between us and can really appreciate the variety of art we are getting to see now. Listen to GoldLink's new album At What Cost.